Real People. Real Progress. Real Fat Loss. Since opening Catalyst 4 Fitness, I’ve had the opportunity to meet some incredible people. Each has her/his own story, obstacles, and successes. One of these women is Jenny Gothard. Tell us about yourself. I am employed full-time in the corporate world, a wife, and a mother of a college sophomore and high school senior, both of whom are accomplished runners. How long have we worked together? In what capacity? I started with Get Fit 101 in January, 2016 at the Anderson Park District. I have taken consecutive sessions of Get Fit 101 since. I took one of Sharon’s Boot Camp classes when the opportunity arose, and am now transitioning to Metabolic Explosion Training classes. Currently, I take one class each week, although I am hoping to increase that to two classes a week later this summer or at the latest in the fall. What did you expect when you started on each? I wanted to start a fitness program to increase my fitness level and to lose weight that I have gained in the past year or so. I feel like my skill set and fitness level have progressed to a point that I am ready for a more advanced class like MET. How do you feel now? I feel terrific. It is amazing how much better I feel in less than 6 months of classes. I can’t wait to see how I feel when I have my first fitness revolution anniversary next January! How has your body changed? To be honest, I have gained a couple pounds, but I am less concerned about that than I otherwise would have been since I know that muscle is more dense than fat. Now that I am in the fitness routine, I am starting to take to heart the sign in Sharon’s studio that says that weight loss is 30% exercise and 70% nutrition. I am starting to think about the role of nutrition in my weight loss goals. Maybe sometimes you have to get a bit worse before you start to get better. Ask me again in January, 2017! What non-scale victories have you experienced? I am proud to tell my colleagues that I take fitness classes. I am surprised by how proud of me they seem to be. I think my family is proud of me too. I talk about doing regular push ups, and how many I do each class! Just don’t be taking any video of me on your phone, or else they’ll see my push ups are pretty pathetic! I’m trying though. I was very pleased with my 40 second wall sit last week – my first time that I didn’t have to stop during it. Are you stronger? I feel stronger! I really do. I knew I had a very weak core going into the classes in January. I feel like it is getting stronger. How has your health improved? I am on the verge of needing to take blood pressure medication. I will be very interested to see my blood pressure numbers this fall when I have my physical. I am hopeful that they have dropped. What are your goals? I want to be able to continue to lead an active lifestyle for many decades to come. As a family, we love to hike, kayak, swim, and cycle. I want to lose some pounds and keep them off. I want to be healthy. I want people to say I look younger than my age, and fitter than my age. If you have tried fitness and nutrition plans in the past, what did you try? Why didn’t they work? How is this different? I have been able to make it this far on good genetics alone. I’ve never dieted. Also, I have not engaged in a regular exercise program since my freshman year of college. What worked for almost 30 years suddenly quit working in 2015. I saw things changing quickly, and knew that I had to so something. 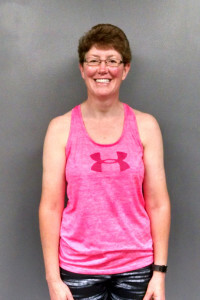 I saw a listing for Sharon’s classes in the Anderson Park District newsletter, and thought GetFit 101 accurately described my fitness level, and thought to myself “if not now, when?” I didn’t want the answer to be “never”, so I enrolled in a class. What is the best part about working with Sharon? I love how hard she makes me work. I would never be able to push myself like she does if I were working out alone. She makes me sweat (a lot), and feel the burn, and it feels great and exhausting at the same time! Group classes are fun. Sometimes I talk; sometimes I listen. It is always enjoyable. What is the worst part about working with Sharon? The day after. I still get very sore, but have found the soreness lessening over time, and I do think the recovery drink she recommends really helps. I resisted it at first, but she is quietly winning me over to the healthy lifestyle that she promotes. What would you tell others who are hesitant to start?​ Please sign up for a class through the Anderson Park District, and attend every class that you possibly can. The more you do it, the more you’ll love it. I’m hooked and it is not even been six months since I started. Real People. Real Results. – Gina B.